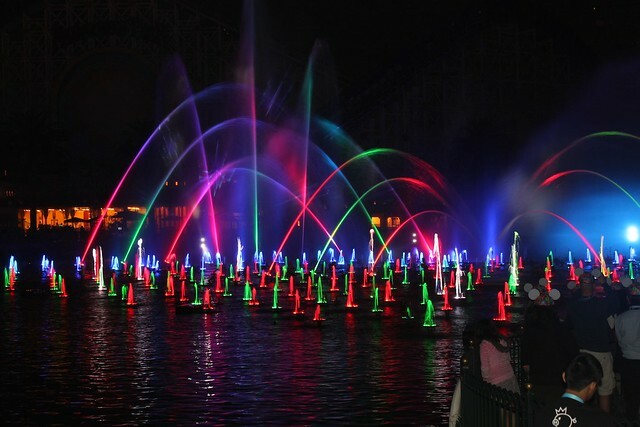 Since World of Color first debuted in June 2010, more than eight million theme park guests have gazed upon the nighttime spectacle of dancing fountains and vibrant projections, performed more than 2,100 times. Disneyland has regularly updated the show over the last 3+ years with new sequences and scenes from the latest movie releases. 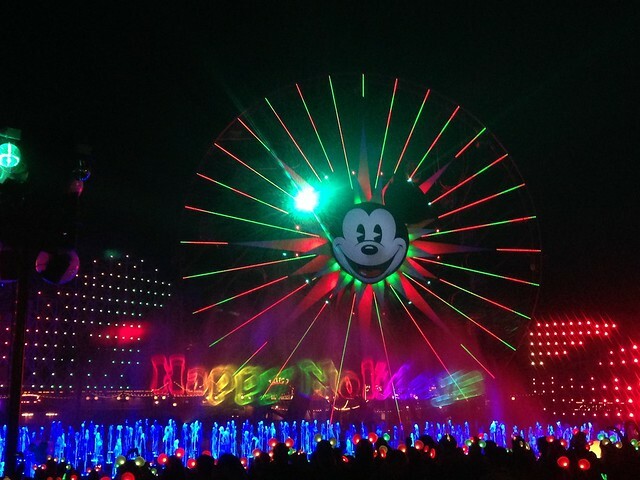 But it wasn’t until this Christmas season that an all-new World of Color show has finally premiered. Making its debut in front of a crowd of press and Disney Parks Blog sweepstakes winners, World of Color – Winter Dreams showed off 30 minutes of holiday fun hosted by one of Disney’s newest characters, Olaf the snowman from the upcoming film “Frozen.” In attendance to help mark the new show’s debut was actor Josh Gad, voice of Olaf, alongside Imagineer and World of Color creator Steve Davison. 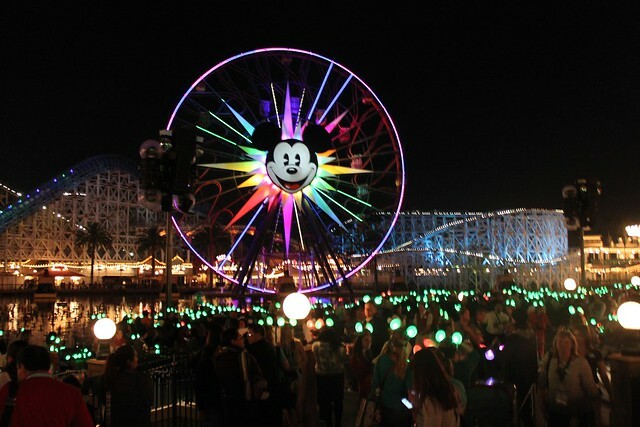 The crowd was given complementary Glow With the Show Mickey ear hats to interact with the new version of World of Color, adding an extra layer of visual pop to the already packed performance. 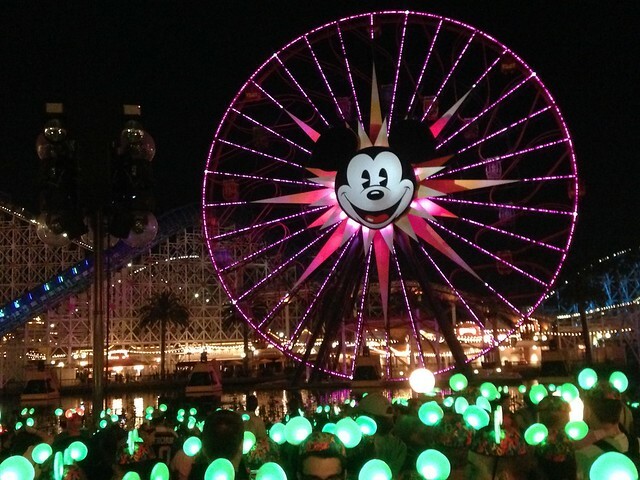 It’s the second time Disneyland has created a big scene surrounding the Glow With the Show ears, first occurring with their unveiling in June 2012. With everyone eared up and in position, Disney California Adventure ran World of Color – Winter Dreams for the public for the first time. The new show starts off with an unusual twist, a virtual choir assembled from Disney fans and singers who over the last few weeks submitted videos of themselves singing the same song online for composer and conductor Eric Whitacre to assemble into a beautiful mix. Other Disney classics make the mix, such as Bambi and Thumper sliding across the ice. 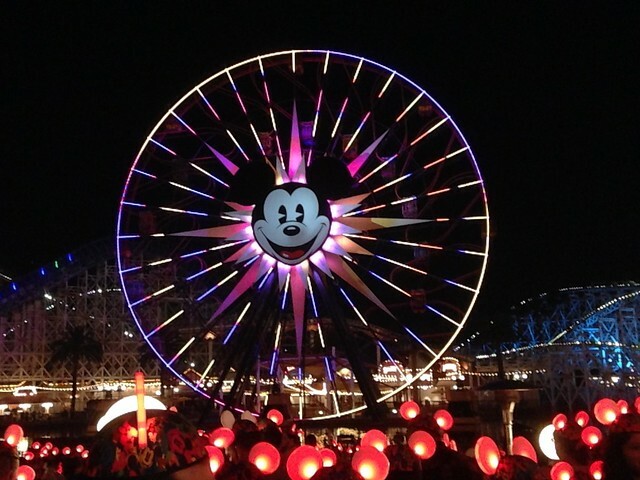 In the end, new lighting effects were used across Paradise Pier, illuminating the California Screamin’ roller coaster structure with a grid of color as the show’s fountains danced and Mickey’s Fun Wheel lit up. Nearly 700 high-power LED strobe lights now line California Screamin’, each with four individual control channels. Also added in the viewing area are six “snow generators” which create giant, floating snowflakes in six different designs. It’s an impressive set of additions that ought to carry forward well beyond the Winter Dreams version of the show. As with the Glow With the Show debut, the usage of the synchronized ear hats was impressive on this Winter Dreams debut night as a sea of heads all illuminated in time with the music. On an average night, the sight isn’t quite as dramatic with only a handful of guests wearing them. It’s a concept that needs to be be employed en masse to fully be enjoyed. 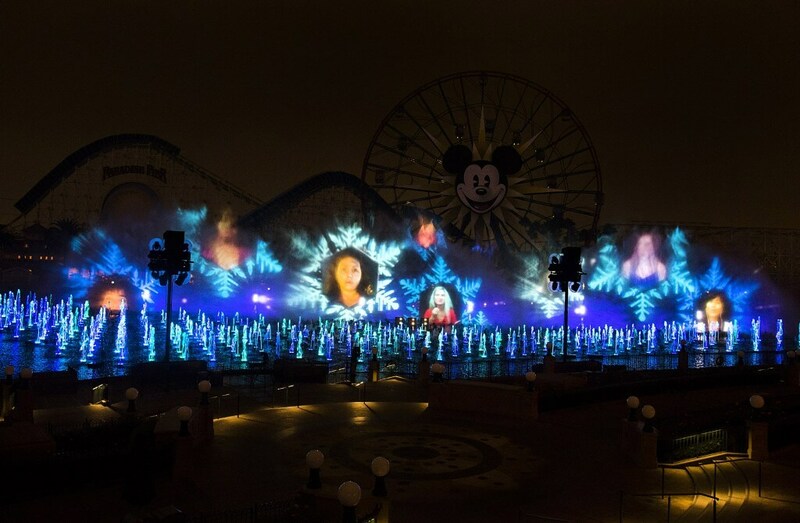 World of Color – Winter Dreams continues nightly at Disney California Adventure through January 6, 2014, included with park admission. Video by Carmelle Marshall. Photos by Shawn Marshall and Disney. Wow Amazing!!! Looks like “Glow With The Show” works better at DL then at WDW. Really like the new WOC but my problem is they’re really trying to push this movie ‘Frozen’ which nobody’s even seen or heard much about. Also this Olaf character is annoying and Disney is pushing him hard like we know him. Just like they did with Prep and Landing last Christmas. Well why wouldn’t they push “Frozen?” It’s the newest addition to the Walt Disney animated classics, and it ties in perfectly to the holiday season. And if nobody has heard of “Frozen” yet, all the more reason to advertise. Anyways, I’ve heard lots of great things about this show, but I think I’ll wait to see it myself until after “Frozen” comes out. I don’t want to be spoiled. Don’t worry about spoilers! Although there are two songs and plenty of Olaf, none of the plot elements are revealed. I’m mostly worried about not being overwhelmed when I see the movie by hearing “Let it Go” before I actually see it in the cinema. Someone told me that the the orchestra for Elsa’s segment is far superior than the actual orchestra in the movie and I don’t want to set the standard too high and risk being disappointed. Olaf hosting was terrible. It was very highly projection base and they used the water mainly as a giant screen. I think that it would better if they had Nightmare Before Christmas or how about a little homage to the Santa Clause. Okay, Florida kid here, so I can’t go see this show since it’s in California, but I have to agree, the song is much more spectacular in theater, and longer. Although I did like the part where Elsa throws a snowball at you. Otherwise, they could’ve done better than repeat “Here I stand in the light of day”. After the second verse it’s Here I stand and here I’ll stay, which I feel is much more appropriate. As for Olaf, he is really funny in the movie, but I’ll have to see the full show myself to see what he’s like. You obviously don’t have children that watch the Disney channel. I have two daughters and for months before the movie came out they were talking about it. It’s disappointing to know you didn’t like this movie…. not only has it been one of the biggest disney hits since beauty and the beast it send a much more positive message to kids about love than any other film. True love doesn’t have to be in a prince charming nor does a happily ever after needs a significant other. This movie is all around powerful and funny. Olaf is a great addition showing innocence of the girls hearts when they were just girls. He’s suppose to be a bit silly. Please remember disney is more than rides and a show. Humble Tx! Just wanted to mention keep upp the great work!